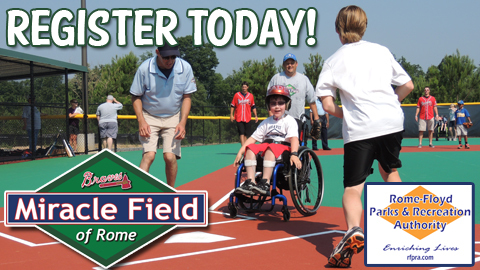 The Braves Miracle Field of Rome kicks off its fall season beginning Saturday October 20th. The Rome Braves and Rome Floyd Parks & Recreation Authority are in need of volunteers for the season that runs through November 17. The younger division will play each Saturday at 12:30pm and the older division will play at 1:30pm. A pre-season practice will be held on Saturday October 13th. For those interested in playing, the registration fee which includes your uniform and end of season reward remains $50 per player. Scholarships are available. If you have any questions, please contact Tammy Bryant with RFPRA at 706-234-0383 or Erin Elrod with the Rome Braves at 706-368-9388. Click here to download a registration form now.